Paul Zitzer is a long-time pro who once rode for Tony Hawk’s Birdhouse Skateboards, and is the only vert skater to have a part in Josh Stewart’s Static video series. 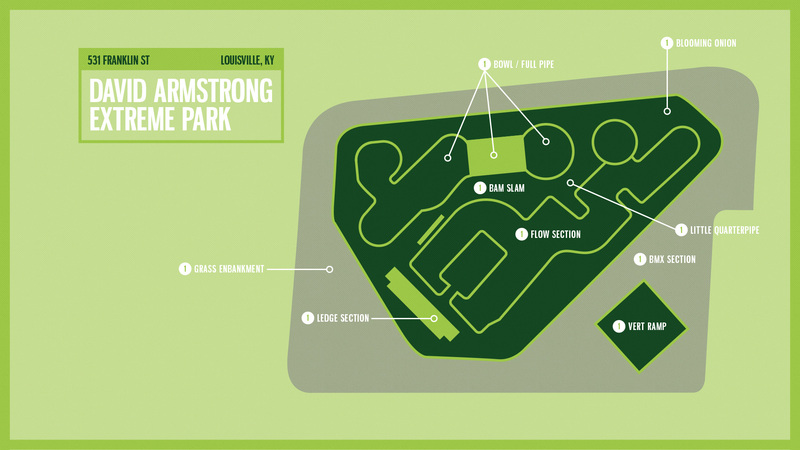 As someone who’s lived in Louisville, Kentucky for years, Paul has seen the many ups and downs of Louisville’s David Armstrong Extreme Park, which everyone just calls “the Louisville Park.” He even played a role in its recent remodeling, helping improve the park to meet the demands of today’s skateboarders. This park was built in 2001 or 2002. Half of it’s new and half of it’s old. The reason there is a new section is because they had to build a new bridge, and they just finished a new bridge over the river right next to the skate park. They had to move the skate park over like 100 feet to make room for one of the bridge supports. The park was pretty terrible and it’s all we were gonna have in Louisville for a hundred years, but thankfully this bridge project came up. The city was forced to tear down the old section and rebuild it. The vert ramp is garbage. It’s so hideous. It’s just falling apart. Every seam is popped up. There’s graffiti all over it. There’s blood stains on it. It’s the worst. It’s kinked, it’s terrible, and no one uses it except for kids as a slide. One day, I went there and kids had just gotten arrested for trying to burn it down. It is BMX Town over here these days. There’s always been a pretty big BMX scene in Louisville but now it’s super segregated at the park. The bikers own this section ’cause half of it doesn’t have coping. it just rolls over. There’s these really weird hips that feel totally unskateable. BMXers are just flying around there constantly and I feel like if you even roll through it, you’re taking your life into your hands ’cause you never know where the next BMXer is gonna fly out and plow you over. That’s the old ledge section. For years, you could measure the one square foot of the edge of one of the ledges as the most used section of the entire park. There [are] all these ledges but most of them are terrible. There’s this humungous park that everybody outside of Louisville is like, “That park looks great! You guys are so lucky.” But if you go there, there’s basically a hundred kids skating one ledge and the rest of the park is just sitting there ’cause it’s so bad. We got forced into designing something with a full pipe attached, which is why we ended up with another huge bowl and full pipe. There is this weird law that states if something gets torn down due to a state project, you have to rebuild it almost exactly. It’s called Functional Replacement. The dudes at the city were going to tear down the old park and rebuild exactly the same way. It’s huge! Eleven-foot transitions and two feet of vert. It’s not easy to skate. There’s only a handful of people that skate it but it’s pretty amazing. If any vert dudes or bowl dudes are reading this, they should come skate with us. It’s OK. The top section has no coping, so in my view it’s pointless. You can ollie over the hips, but besides that what are you gonna do? Nothin’! There’s a spine in there at the bottom. It’s fine, some people use it, but it doesn’t get skated much because it’s not that great. It looks cool but it’s just kind of a stupid obstacle. Each of the sections is four feet wide. You can transfer between them but at the second one they start to get over vert, and by the middle it’s like a three-quarter pipe. What can you do on something that’s four feet wide and a three-quarter pipe? In the initial designs, there was a super rad hip that would have been perfect right there. Some dude at one of the meetings was like, “BMXers are gonna be blasting airs over that hip and flying back up the street course. They’re gonna smash into us and kill us. I think there should be something they can’t get as much speed off of.” So this is what we ended up with and it’s basically there for looks. It’s totally pointless and it messes up the entire flow down there. The most fun thing in the entire skate park is this little quarterpipe. It almost goes to vert. It’s only three feet tall and just super fun. I could have fun there for days on end. I think the skate park is more known for terrible things happening to people than for [people doing] cool tricks. There used to be this big grass embankment that overlooked the park, [which] is where the new bridge is. People would come to town and camp on that embankment and they’d stay up all night. I always compared it to Amsterdam. Anything goes down there. I was always shocked that the park didn’t get shut down due to just delinquency. The story I hear most is the one about a kid who died when the park just opened. There were no railings around the deep bowl and some kid on a bike did a 180 out of the street course and rolled backwards into the big bowl and fell onto his head. To this day, I don’t know if he died but that’s the legend. They say a kid tried to do the fullpipe and died but I know that’s not true. There’s no way you could get speed to do the fullpipe; that’s just an urban legend. Bam came here one time. He just got out of a van, rolled into the fullpipe, hit a giant pot hole in the full pipe, broke his collarbone, and went straight to the hospital. That was the old full pipe. It had tons of potholes. One of the coolest things about the park is how much the city has supported it. They still have lights on 24 hours a day and there’s no rules. There’s no fence around the park, nobody checks for any helmets or wrist guards, you don’t have to pay anything, and you don’t have to check in. That’s pretty amazing, especially considering how many problems the city’s had with it.